Changing NDIS service providers: Lifelong Pathways has recently been receiving many calls about changing NDIS service providers. Most people do not know where to start, although they know that they are not happy with their current service provider and would like to consider others. We would like to share the key points of this process with you. Firstly, it is important for you to know that as an NDIS participant (or the nominee of a participant), you have numerous rights as the client of a service provider. 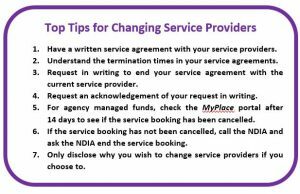 One of these is that it is your right to change NDIS service providers at any time. 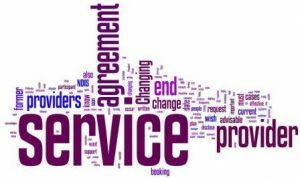 To change a service provider, the first thing you need to do is to end the service agreement with your current service provider. This must occur before you can change to a new service provider. It is advisable to end this agreement in writing, such as in an email, so that there is a written record of the date you requested it. In some cases, people have contacted us and indicated that there is no service agreement with their current provider. This is disappointing, because it is a requirement of being an NDIS-registered provider that there is a service agreement. It is also advisable to have a service agreement even if you are managing the funds yourself, or you are accessing the services of a plan manager. A service agreement is very important in protecting your rights, especially in situations such as changing service providers. If there is no service agreement is it still advisable to formally end the verbal agreement that you have with that service provider. You should also check the terms and conditions of any service agreement you have with the provider. In some cases, the termination of the agreement will be effective immediately. In other cases, the service provider may include a statement that termination becomes effective after a period of time (e.g. two weeks) from the date that you notify them that you wish to end the agreement. When you are requesting that a service agreement cease, it is also helpful if you can request an acknowledgement of your request in writing. If the NDIS funding is agency managed, there is another critical step that must occur. The former service provider must end their service booking on the MyPlace portal, so ensure that you also request this of them. A service booking can only end a minimum 14 days after the date that the service provider makes a request in the MyPlace portal (so that the service provider has time to make claims for any outstanding services that have been provided). Therefore, the request by the service provider to end the service booking must been completed as soon as practicable. If it is not, your new service provider cannot create their own service booking. Some service providers do not ensure that they end service bookings when requested, and on several occasions we have had to call the NDIA and request that the NDIA end the service booking. The transition between service providers can be smooth if all these steps are followed. Please note that you are not required to disclose to the former service provider why you wish to change service providers. It is entirely up to you if you choose to disclose your reasons for changing NDIS service providers.